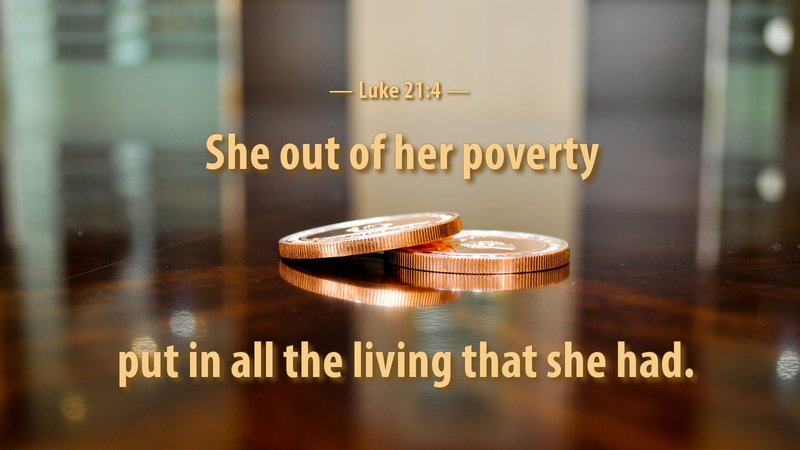 The story of the widow’s two coins, given out of her poverty, speaks to us today. We wrestle with abundance and need. We struggle with whether we have too much or too little. We want to be generous but we have to provide for those who depend upon us. We want to give for the right reasons, rather than for the recognition of others. One might think that, during the season of Advent, an appropriate devotion on this passage would encourage a proper focus on giving and gifting. It might be aimed at challenging folks to remember the poor in our midst who have little more than two small coins. Or, a devotion might be expected to beat up a bit on those who are wealthy and well-to-do who give but a pittance out of their abundance. As we approach Christmas and our celebration of God’s gift of his Son, isn’t it worth considering the Son’s complete, total gift of himself on the cross, as we hear of the widow’s gift? We don’t often consider it, but Jesus’ is the greatest gift—a once-for-all sacrifice for us and our salvation. And was this out of poverty? While Jesus was poor in earthly terms, he was rich—as His whole life was lived in obedience to the Father, giving his life, yet receiving it back again. Though Jesus gave out of a poverty of worldly wealth and possessions, he gave from an abundance, truly. Prayer: O God, help us to consider not our poverty or our abundance, but the joy of giving, through Christ our Lord. Amen. Advent Action: Consider sending an offering to a mission congregation—a totally unexpected gift at Christmas-time!